I found a nice surprise in my mailbox today. I found a small bubble envelope, self addressed to myself, and I couldn't remember what it was? I hadn't sent anything to a private signing for a long time. 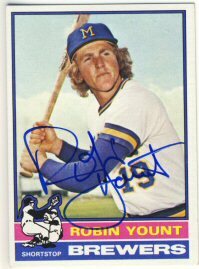 I opened it to find a Robin Yount signed 1976 Topps! 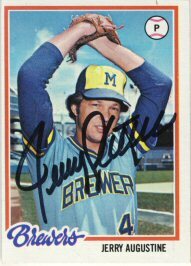 I had sent this to a signing back in January, but Yount apparently broke his hand, The signing was delayed many months, until finally getting done at the National earlier this month. I had completely forgotten about it and probably wouldn't have noticed for a long time that I hadn't received it if it hadn't come back. I've sent out just a handful of requests lately and received the first one back today. 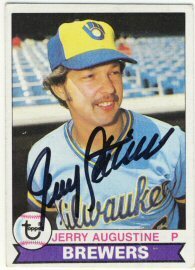 Jerry Augustine signed his 1978 and 1979 Topps for me in about 10 days.